San Diegans traveling through the mountains on Spring Break may contend with troublesome winds, Thursday and Friday. The National Weather Service has issued a High Wind Watch for local mountain and desert areas, in effect Thursday at noon, until Friday at 4 a.m. Sustained winds out of the west, of 30 to 40 mph will be accompanied by isolated wind gusts up to 65 mph. A High Wind Watch means that there is potential for a hazardous wind event. Should those conditions materialize, a High Wind Warning would be issued. 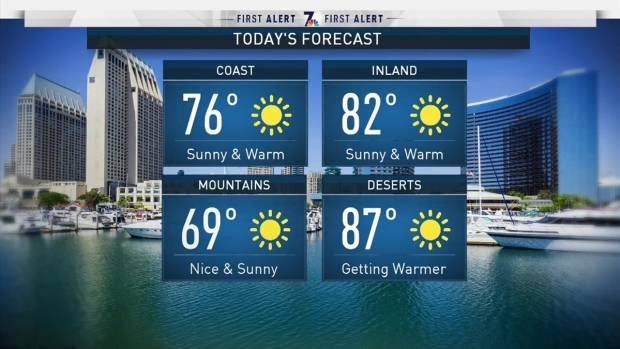 NBC 7 Meteorologist Jodi Kodesh said that a rapidly developing storm system over the Great Basin will pull winds from west to east, through the mountain passes, blowing with strength through the desert slopes and across the desert floors. High profile vehicles are urged to use caution. Blowing sand may also reduce visibility to less than a mile, at times. Palm Springs, a popular Spring Break destination, northeast of San Diego, is also under the High Wind Watch.